ever drink yogi tea? it sends us little reminders sometimes. When my husband cautioned me against driving in “the weather” (in P.E.I., that means snow, and in this case, 2-4 cm), i scoffed. i told him he worried too much, and that he should live a little. I rolled my eyes. “I’ve been driving for six years, babe,” i added (i didn’t get my license until i was 28). Like in an instant on an icy road, that would have mattered. It’s you versus the elements. And the elements don’t exactly care about your driving record. Grammie’s house was only an hour away and Lei was pumped for her sleepover. After a cup of tea with Mum, she cautioned me to go super slowly on my way back to town. The blustering snow was coming down a little harder now and the roads were covered. It was starting to drift. No problem, i said. I laced up my boots and kissed my six year old goodbye. I didn’t even think twice. Little did i know that only moments later and probably not four kilometres away, i would catch my tire, and spinning out of control, nosedive into the ditch, and flip my truck; seconds later i would crawl out the driver’s side window upside down and to the icy ground beneath. I passed a school bus once, because it was foggy and I didn’t see its lights were on. That was traumatic. This was something else. This was divine intervention. I assessed my condition as soon as i left the x-trail, upside down, tires spinning and the headlights still on. I didn’t have a scratch. I wasn’t broken, i wasn’t in pain, i could see; i was intact, though i looked down at my body to be sure. I was ALIVE. 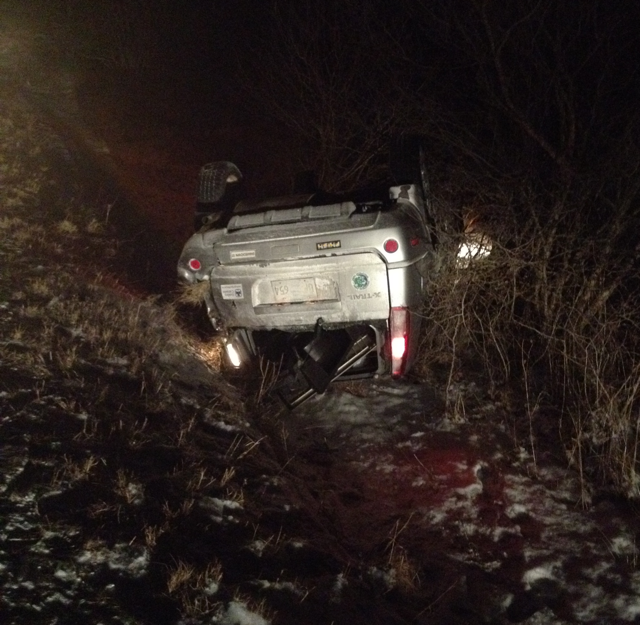 When I was calling the tow truck, i saw another car go into the ditch on the opposite side of the road. I cursed. I was ALIVE. When the policeman invited me into his car to get my statement, he ran my plates and was kind enough to remind that that my truck was no longer registered. You’re two months overdue, he said. Yes i was; and I was ALIVE. When Mitch’s sister and husband came to my rescue, i was in a state of shock. I just kept repeating, “I’m ALIVE! I’m ALIVE!” I kept thinking that there must have been a reason that i crashed, like to prevent an even greater catastrophe down the road, maybe one where i wouldn’t have been so lucky. But unfortunately for my glorious x-trail (“exy” to those who knew and loved her), she left this world a brave soldier: windshield shattered, windows blown, airbags deployed. We collected the scattered items that Exy had carried, and before i left, my brother in law handed me a crumpled up parking ticket, half frozen and covered in snow. but for every precious moment in it. And I thought about him on the road that night, as i watched them tow my crushed truck out of the ditch. And I thought about Mitchell waking up on a Saturday morning and not having a wife anymore, and I thought about Leila not having a mother. And I cried my eyes out. And I thought that I must not be finished here – that I must have been saved because i have work to do yet in this life. How crazy does that sound, now, only one week later. 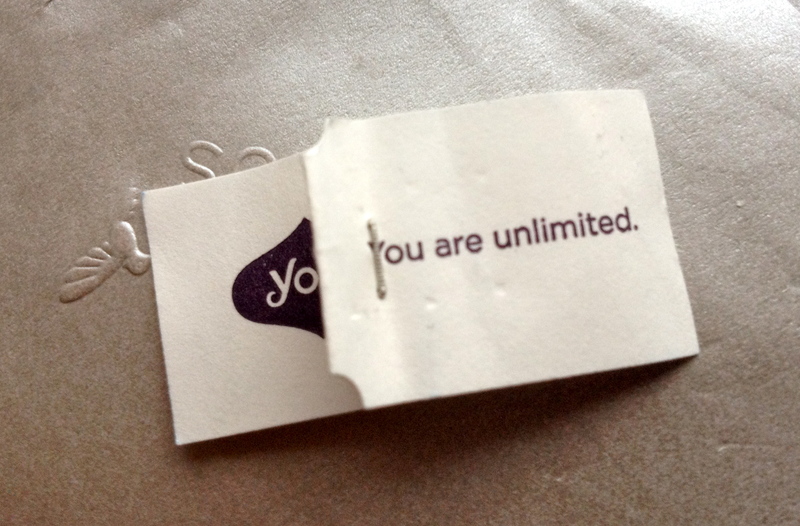 The next day I had tea with my dear friend, and when she handed me a cup of licorice tea that said, “you are unlimited,” i burst into tears again. It reminded me of the time just after we lost our babe little t, gone to the ether. A friend asked me to select a card from her oracle deck, claiming that they were always poignant. The card I chose read, “Acceptance”. And that was the day i started to let go. By Monday the physical manifestations of stress had set in: the pounding headache, unphased by the ibuprofen, the walloping head cold, which came out of nowhere, and not one, not two, but three cold sores, which violently attacked my upper lip and put me in the grouchiest of moods. By Tuesday, I was bed-stricken and couldn’t work. yikes. And life goes on. The moral? Live for this moment. This moment is your life. Thanks babe. We do what we can and rest it up to the rest, eh? I get so much from reading this and the timing couldn’t be any better as at 6:20 this morning Humberto did a similar thing in his corolla on the way to work. He did a few 360’s in the middle of the road and then landed down in the bottom of a steep ditch, though thankfully not onto the roof. We are very thankful he is ok.
Oh no, Steph! It’s such a shock to the system, and we’re only left with what if – have a glass of wine with Humberto tonight and celebrate life! Hugs! Thanks Gaby – it was a scary one! Mo, you inspire me to go out and get what I want to out of this life!! So glad you are ok. Hope the aches and pains are not too bad. See you when I get home! There’s no time for much else. A couple of bruises and scrapes, but no major damage. Now on to car shopping. Looking forward to seeing you when you get home, Marg! Oh, Mo…Thanks for sharing…You are ALIVE!!! Life events often do have a way of pulling you up short and making you realize how very precious each moment is and how very lucky we are. So glad you are okay Mo! This is a first time; I read a long English story which isn’t my homework. At the first time, I don’t know it’s a ture story, but after I saw some replies. I just can’t believe it was really happened to you, then I spent my time read the second time. I just want to say: Thank you are alive, Mo!!!!!! Good for you, Ann! Thanks for visiting the blog. Wow Mo. Thanks for sharing your experience. Sometimes you forget where you’re headed and then a moment like this, as tough and traumatic as it is, you know it was meant to happen so that you can move to the next phase. I just read this post now. Oh Mo, I would have given you a much bigger hug when I saw you on Saturday! Like I said, hunks of metal can be replaced, but not our Mo. So thankful you’re okay. Stress and Shock is what you were experiencing, the best thing is to keep warm and talk about it…so says the first aid course I was just at!! Someone was definitely watching over you.To be sure there is more for you to do. I firmly believe that things happen for a reason. I’m so glad you weren’t injured. Thanks for your comments, Laura – sometimes the reason can be difficult to figure out, but yes, i believe that too!